"The flavour that hits you"! These crispy crinkle cut potato chips have BBQ flavour in every crinkle that make you mouth water with every crunch. Potatoes, Sunflower Oil, Sugar, Vegetable Powders (Tomato, Onion, Garlic), Salt, Spices, Corn Starch, Flavour Enhancer (E621), Milk Solids, Food Acid (E330), Flavour, Herb. I have always LOVED these chips. They have been my favorite from the first time I tried them, many many moons ago. Try them, you'll love them. 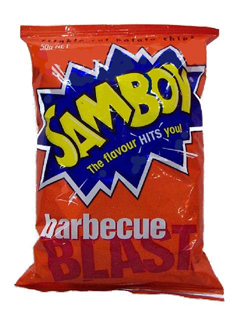 I don't think there is a chip/crisp that can compete with the zingy flavour that BBQ blast has. They are a rare treat for me, but if I could afford to they would be in my life regularly. These crisps/chips really are the bees knees. Everyone I have introduced them to adore them.